Kibsons is an online home delivery service in the UAE bridging the gap between you and farm-fresh ingredients. 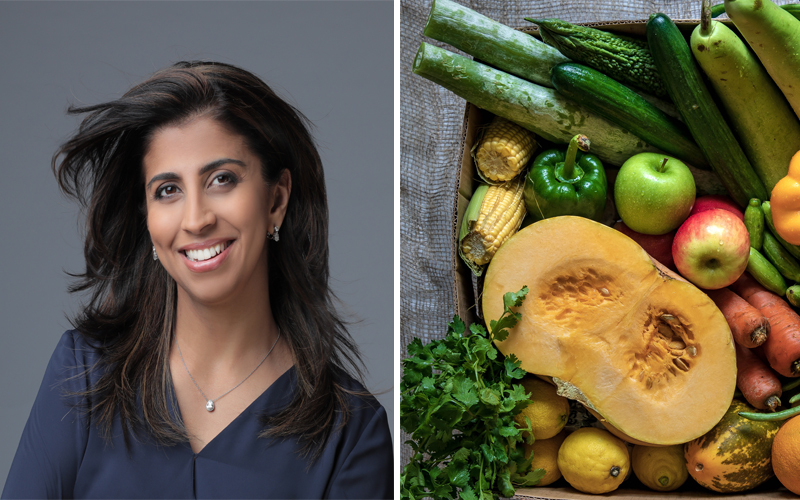 Director of Kibsons, Halima Jumani tells BBC Good Food Middle East how residents can now order a wider range of organic products online for doorstep delivery at lowered prices. There’s nothing quite like the excitement of having a box full of fresh, colourful fruit and veggies delivered right to your door, particularly when there are no premium costs involved, no fighting your way through hectic supermarket aisles, and not a scrap of plastic to be seen (we’re all about #saynotoplastic). When it comes to wellbeing, a big misconception today is that eating healthily comes with a hefty price tag. And yes, while a big percentage of organic and healthy ingredients sold around the world is priced much higher when compared to the not-so-good for your stuff, companies like Kibsons are defying the trend by furthering accessibility to premium ingredients that are 100% natural, with no hormones, additives or artificial preservatives, at affordable rates. Our core business since 1980, Kibsons offers an ever-increasing range of quality fresh fruit and vegetables from all continents. We supply a wide selection of premium produce options, organics, bulk packs, pre-packs and ready-to-eat products to a wide range of happy retail and wholesale customers in the UAE and beyond. Convenience, quality and value are Kibsons unique selling points. By controlling our own dedicated importing, warehousing, distribution, IT and customer service teams we are able to optimise product quality and ultimately improve value to thousands of private households in the UAE. Kibsons also offers a wide range of imported and processed meat and poultry products produced in our HACCP approved facility. Historically catering only to airlines, catering companies, restaurants and hotels, our home delivery customers can now experience the same levels of product quality that we have supplied to the wholesale market for years. The meat range includes organic, hormone-free, premium and value-added products to suit every taste and customer requirement. Stemming from customer feedback in recent times, Kibsons now also offers a wide range of homemade sourdough breads, organic dairy and eggs, portioned seafood, organic spices and oils, imported honeys, healthy snacks, pastas, breakfast cereals and healthy. We want to offer real value, quality, taste, convenience and healthier options in all of these categories. Where is the produce on offer sourced from? With over 30 years’ experience developing our supplier relationships, Kibsons has a broad and trusted farmer base offering premium products at the most competitive wholesale prices. A very wide range of products are sourced seasonally from local farms as well as other specialist growers on every continent. Does Kibsons work with any local farms and brands? Kibsons love to support local farms, brands and businesses. We have strong relationships with large and small suppliers who are proactive in their approach to growing and supplying high quality produce consistently, responsibly and economically. Many new local farms open up each year and we will work with as many as we can to ultimately satisfy the needs of our customers. Does Kibsons offer any ready-to-make meal boxes for customer convenience? Yes, we want to save our customers time whilst helping them to make healthier choices. Recently we launched pre-packed smoothie boxes which have been a huge hit and take the guesswork out of smoothie making for consumers on the go. Ready-to-eat meals and meal mixes are interesting concepts and we are currently researching the specific needs of our customers to develop a range that suits them best. What organic ingredients are available through Kibsons? Kibsons work with and support local and international organic producers and stock a wide range of organic products across all categories. Trust in organic labeling is key and all of our organic products are certified to EU and international organic standards. Our local partners, Mawasim organic, are the largest and leading organic farm in the UAE and provide a range of high quality produce throughout the UAEs growing season. Organic products have long been associated with high prices however the organic movement is now gaining momentum and these products are slowly becoming more affordable and popular. Kibsons goal is ultimately to make a wider range of organic products accessible and affordable to the masses so that consumers can make ‘healthier’ choices wherever possible. Fruit and vegetable are natural products and differ in size, shape and aesthetic appeal depending on their variety, origin and seasonality. Traditionally consumers only accepted the best looking produce however attitudes have changed noticeably in recent years. In an effort to minimise food waste and offer better value to our customers, Kibsons now promotes and sells ‘uglier’, imperfect produce at reduced rates. Global awareness of food waste is on the rise and our customers really appreciate our efforts to become more sustainable whilst saving them money. What steps does a customer take to place a delivery through Kibsons? We often receive positive feedback from customers that our online ordering process on kibsons.com is super easy and straightforward. One needs to fill up the cart and check out. As simple as that. We offer same day deliver with three delivery slots. Payment can be made by cash, card on delivery or online payment. We also have a Kibsons wallet for convenient payment at the time of check out. Above all, customers can save their favourite items to make future shopping even more convenient or re-order from their order history. Are there any upcoming promotions taking place that customers should look out for, or any loyalty schemes that they can be a part of? Our customers collect points automatically when they shop online at Kibsons, and they can earn even more points when they refer their friends to shop on the Kibsons website. All they have to do is share their referral code with family and friends to get them to sign up with Kibsons. Once they sign up using the code, their account is connected as a ‘referred account’ for life. Every time their friends shop online at Kibsons, they earn 20 referral points, which is up to 2% cashback on their friends shopping with us. As for the loyalty program, for every AED 500 worth of shopping, shoppers earn 50 points. When they collect 500 points, they earn an online loyalty voucher of AED 50 to enjoy free shopping. That’s up to 1% cashback on their shopping with us. Details: For more information, see kibsons.com or call +971 800 5427667. If you liked this story, you might be interested in finding out more about Dubai’s growing market scene for fresh, locally-sourced food.